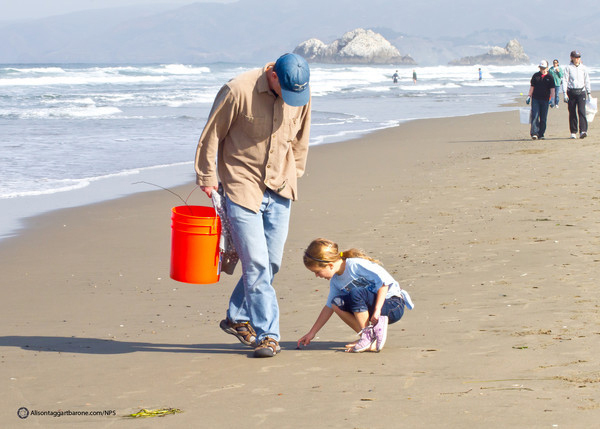 On Saturday, Sept. 16, thousands of Californians will head to the beach, not to jump waves or take in the sun, but to pick up trash. The annual Coastal Cleanup Day draws 60,000 volunteers who pull more than 350 tons of trash and recyclables off the state’s beaches, parks and riverbanks. Volunteers will clean nearly 1,000 sites across the state, including inland areas where trash can be collected long before it makes it out to the beach. Find a spot near you here. The most common items found each year are cigarette butts and single-use plastic items, according to Eben Schwartz, manager of marine debris programs at the California Coastal Commission. "These [plastics] get out into the environment, they last forever, they break into smaller and smaller bits and are ingested by animals," says Schwartz. "They slowly work their way up the food chain, until they end up on our dinner plates."